I can't get enough of geometric shapes. The blog's had lines galore, dots-a-plenty and shapes for days. It's the ultimate nail design, and the possibilities are pretty endless. Right angles and curves really turn me on. Plus, with the left hand out of commission, it's a huge challenge to get those angles down on my right hand. Triangles are the best way to do that. The base color for this is Zoya's Reagan. 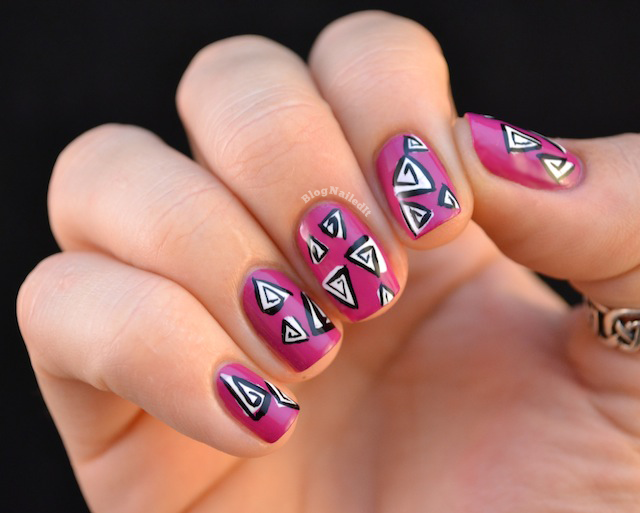 All the triangles were drawn freehand using two striper polishes. This looks great! I love this design, so eye catching! I love this one, it's beautiful! I'm so gonna have to try this! interesting design :) i like it!